How do you go about setting up Minecraft in your school? This is how I did it. Thanks to @RobinThailand for paving the way and being forward enough to ask hosting companies would they host a Minecraft server for free for schools! Redstonehost.com answered his call and provides free hosting for schools! All you need to do is register an account on their website and post a ticket stating your intentions. I had to scan my teacher ID and within a day or so I had my login details. I think the server you end up using is based in France somewhere so yes sometimes it’s laggy but nothing to bothersome. I know a lot of schools are setting up their own servers but my school doesn’t have that luxury. 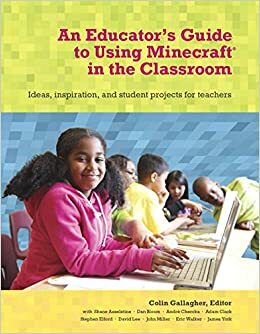 For the Minecraft class I bought 25 education accounts from http://www.minecraftedu.com which ends up reducing the price of an account by over a half than purchasing from the main Minecraft website. Good service. Although their Paypal was not working (I’m sure it is now) and transferring money to Finland cost me some fees from my bank they gave me an extra account for free and said they would set me up with their MCEdu account for testing purposes (still waiting on that). What they end up giving you is a list of 25 codes to use on the main Minecraft website. I made up some mythical usernames, used the old Gmail+1 email address trick to register multiple account on one Gmail account, and we were on our way. Setting up your initial server is a breeze using McMyAdmin dashboard. Creative mode is the way to go in elementary school. A lot of students who play Minecraft a lot are used to Survival mode which involves mining and crafting (funnily enough!) to build things, killing animals to eat and craft things and so on. Creative is a sandbox; everything is available to use and you can fly around! It really is up to you how you set up your world but this is what I went with. 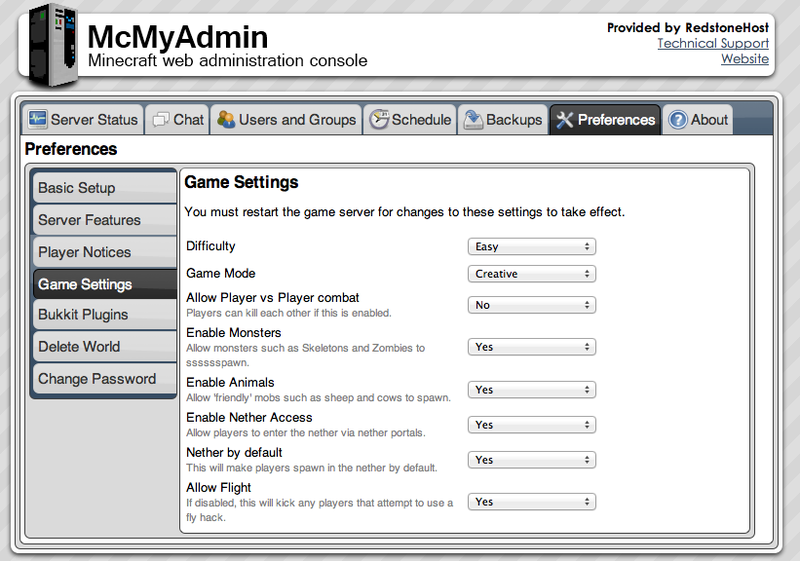 Using FTP access you can put various plugins into your Minecraft world and then activate or deactivate them from within McMyAdmin. 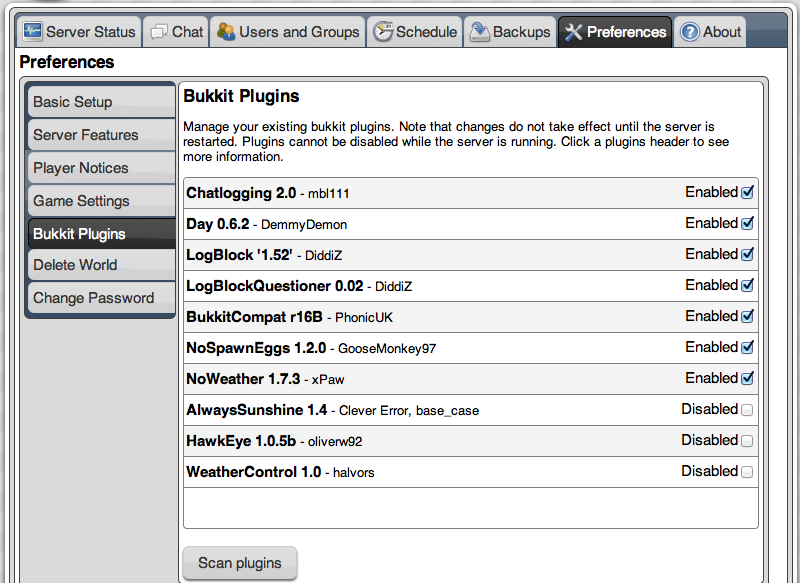 Some plugins you may consider are NoWeather (keeps daytime on, keeps everything sunny). NoSpawnEggs so stop users spawning a million creepers, believe me I had to deal with that in our first class! Behaviour monitoring ones I installed after incidents of griefing, once students know they are there it seems to reduce the number of incidents. Chatlogging keeps a dated folder of chat sessions and LogBlock can keep track of who made and who destroyed blocks by right clicking the area. Now setting up LogBlock is confusing! You first have to set up an SQL database (which involves emailing Redstonehost.com) and then configure it. It took me a while to do it and then…..version 1.2 of Minecraft came out and it doesn’t work for me anymore! Such is life! I’m also having issues with NoWeather but I will have time over the next week or two to see if there any updates or solutions. Again recommended by @RobinThailand I bought the iPhone app McMyAdmin so I could keep track of what was being said in chat and I can turn on and off the server whenever and wherever I am! Money well spent. That’s basically it in a nutshell, I think! It’s a pretty steep learning curve at the start but then it becomes second nature. Learning all the commands with each plugin (and even just the syntax for teleporting users) is challenging and I had to keep a list of them close to hand until I memorized them. It helps if you have played Minecraft before (I have been playing it since Alpha release, I still remember sitting in a darkened cave with Zombies outside; truly terrifying!) but is not totally necessary. I would recommend playing it a few times, though, before you start out with a room full of students. Thanks for the helpful pointers and suggestions – have been wanting to get beyond our standalone set up to a more collaborative setting. Cheers!